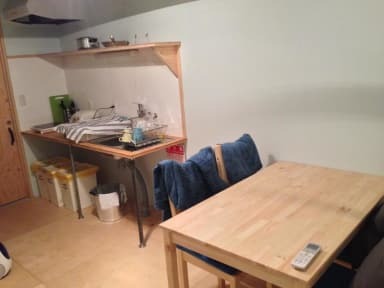 Really good location, close to Okayama station, and really friendly staff. Bloody good stuff. Great staff assistance on check-in, interacting at the cafe bar, and assisting with smooth check-out. The place is really nice. Rooms are standard and good cooking facilities. Really cool bar/ area of to chill downstairs, which sells good food and free drink on arrival. 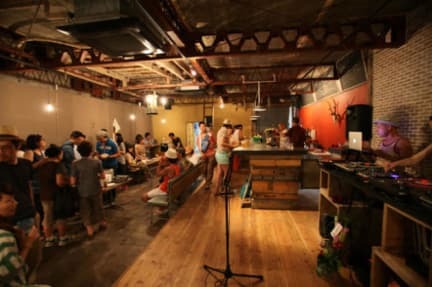 They host events on the weekend to, with DJs, so good way to meet Japanese people or other travellers. The staff were all so friendly and willing to help with food recommendations, what you were up to etc. In particular Miho, was super friendly and even offered if I wanted to go out to the Sakura festival with her family. Pretty close to the station (7 minute walk), and had a really cool 'camping lodge' feel. Facilities were clean, the common area downstairs was very spacious, and it was an overall positive experience. Was a little expensive for its value, given that I stayed in an 8-bed room and paid more than what I did at hostels with overall better quality. Also, the bunks were all empty, when I checked in; but, without choice, I was given the top bunk (despite checking in first and all beds being empty). Nice place to stay for 1 night. not noisy at all and close to all the main atractions. Amazing location near the station and staff were incredible. Was a bit tricky getting my luggage up the little staircase and a bit noisy at night but would reccomend! A really cute hostel with lots of character due to the cafe/bar downstairs. The staff were really warm and helpful during my stay and the facilities were great! I’m only giving it an 8 due to the lack of atmosphere there during my stay - this was largely due to there being no other travellers staying for majority of the time. Perhaps this was an off season for tourism in the area. Overall a great hostel which offered a comfortable stay! By Japanese standards not the best hostel but pretty good all the same. Great location near shops and station. Mattresses were rather thin to non existent. Bar downstairs had nice atmosphere. All up we enjoyed staying here.